Lakshmi's Lounge: Disruption round the corner? iPod inventor — Tony Fadell bats for disruptive tech to tackle sustainability, food security and disease among other things. Every generation has had that one technological device that shapes how that generation lives. For the teenagers of the early 2000’s, it was the iPod — the father of the 90’s Walkman. 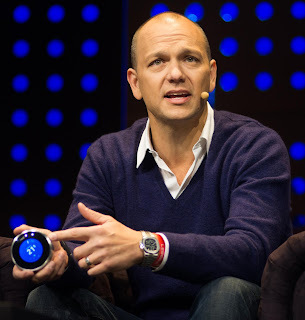 Tony Fadell, one of the inventors of this iconic piece of technology was in town recently as a part of the ninth edition of INK Conference. Fadell also is the founder of the acclaimed Nest Labs, a smart home products manufacturer, that was acquired by tech giant, Google, for a whopping $3.2 billion in 2014.